The City has installed an art project that draws attention to the creeks and watersheds of Oakland. Former creeks, now buried in culverts, are memorialized by a series of bronze relief sculptures embedded into sidewalks at locations above these culverts. 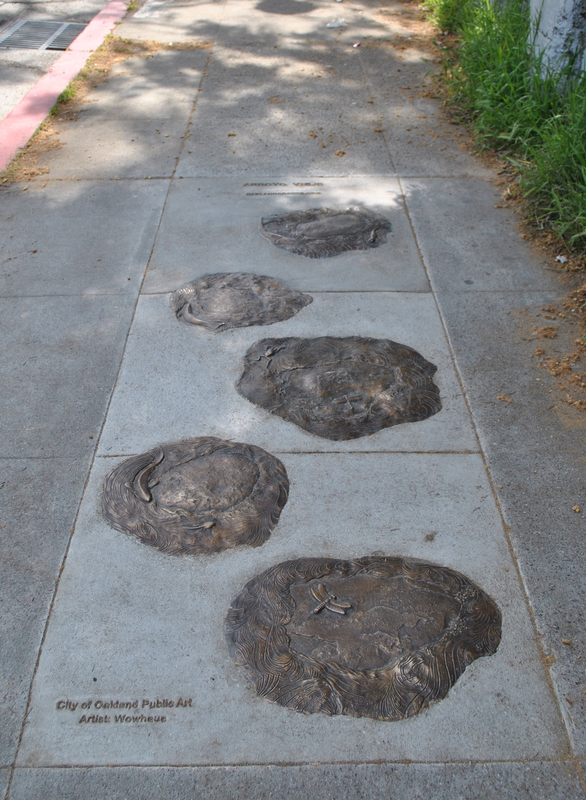 The pieces portray stepping stones surrounded by native fauna that inhabit the creeks such as Rainbow Trout, Pacific Chorus Frogs, California Newts and dragonflies. 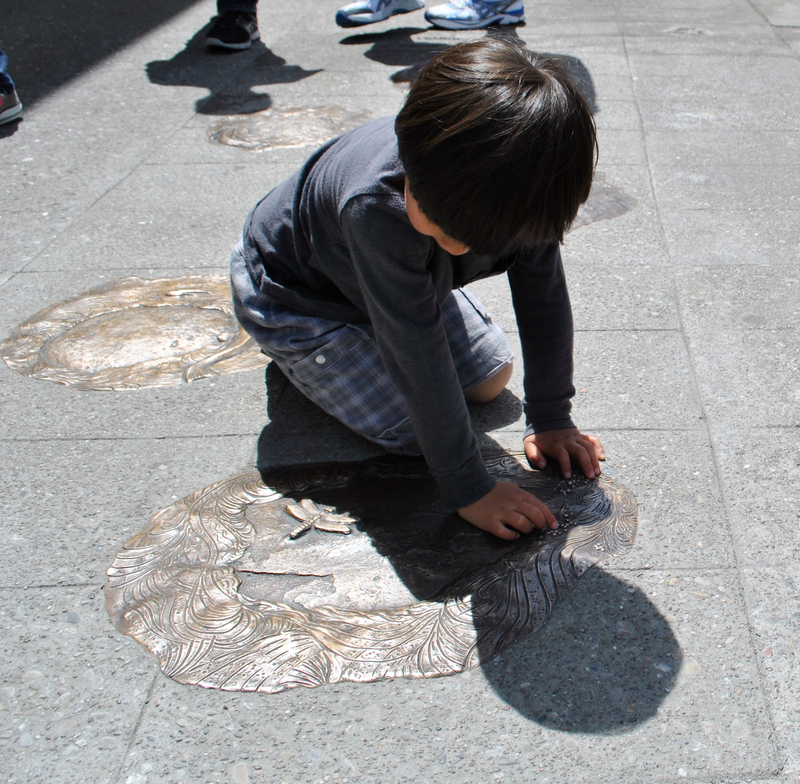 Each site features five bronze “stepping stones” inviting the visitor to step across as if crossing a creek. The project is currently installed at five locations listed below. 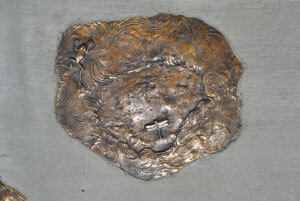 On each marker, you'll see the watershed name stamped into the concrete. View a map of Creek Beneath Your Feet markers. Historically all of Oakland’s creeks flowed in open channels from the hills to the Bay. Over the years as the City became developed and properties and roadways were built very close to or on top of creeks, sections of creeks were buried in underground culverts to reduce flooding and protect properties. Those underground culverts, along with the City’s storm drain system, connect to open portions of creeks and are an integral part of the creek and watershed system. Every time you see a storm drain on the street, you can know that the water that flows into that storm drain eventually flows to a creek, lake, and the San Francisco Bay. Today new environmental regulations prevent building over creeks and it is important to protect and preserve the remaining open stretches of creek that run throughout the City. For more information, please email watersheds@oaklandnet.com or call (510) 238-6600. This project is discussed in this recent Contra Costa Times article. Special Note: The artwork was created by Wowhaus, made up of Scott Constable and Ene Osteraas-Constable, and funded by the City of Oakland’s Public Art Program (Percent for Art Ordinance). 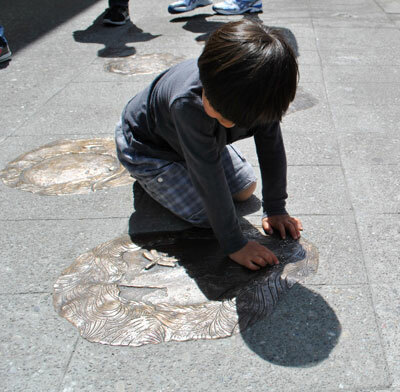 Funded through Measure DD -- Oakland Trust for Clean Water & Safe Parks -- the installations are a collaboration between the Public Works Agency’s Watershed Program and the Community & Economic Development Agency’s Public Art Program. All photos courtesy of Wowhaus.